When you have a child with special needs, you look at the world through the eyes of an occupational therapist, speech therapist, and developmental screening practitioner. We notice developmental appropriateness the way the football enthusiast understands exactly what’s going on in a 2-minute game clip on Sports Center, the auto mechanic can identify whether the smell coming from that car is oil, tires, or gas burning, and the musician knows how to replicate the chords in a popular song on the radio. One of the things that I’ve enjoyed on our journey of having a child with special needs is how what I’ve learned with her applies to my typically-developing children. Here are 5 things that I’ve learned that apply to all families. 1. Developmentally appropriate baby equipment helps children concentrate on what they’re learning. I have pretty minimal baby equipment (click here for my recommendations), but I like to give my children a developmentally appropriate high chair. See how his feet are flat on the bottom shelf in the chair and his knees are bent at 90 degrees? 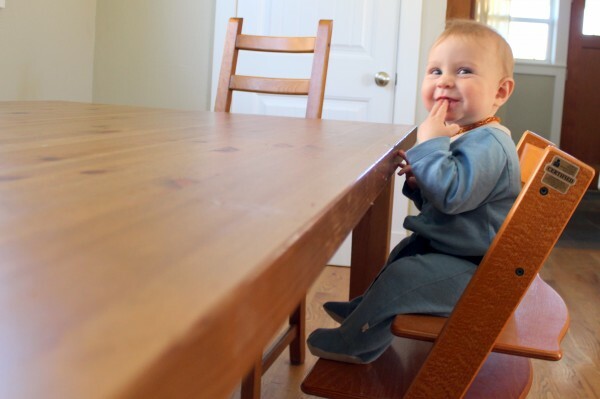 This gives stability to his body so that he doesn’t have to concentrate on not slipping down in the chair or be distracted by dangling legs and swinging feet and can focus on the fine motor activity of picking up little bits of food off his plate. This chair adjusts (you can buy them here) so it grows with him, still providing a place for his feet to rest and a chair that moves down inch by inch as he grows. This will be helpful as he does more fine-motor work at the table – play dough, coloring, finger painting, and more like that. 2. A good diet and getting enough sleep are essential for good development. This used to be common sense, but in our busy culture many young children are getting fast food and junk food even as infants, and they aren’t getting enough sleep. My older children go to bed at 7 in the winter and 8 in the summer when it’s lighter later. They sleep a full 12 hours, sometimes longer, in the dark winter months and a bit shorter than 12 hours in the summer. Yes, this means that we don’t do sports or classes that end after 6 pm. Their physical development depends on sleep, and most of the time getting enough sleep is going to be more developmentally helpful than any kind of extracurricular activity. Well rested children are better able to regulate their emotions, are alert to learn in the classroom, and are more energetic and ready for physical exercise. Healthy balanced meals filled with nutrient-dense food provide the nutrients children need to sleep well, learn, and, again, have the energy for physical exercise. When was the last time your child had a meal that was mostly protein and didn’t contain any processed food or refined sugar? I hope it was earlier today or last night for dinner! Think of nails on a chalk board, walking on gravel, or your least favorite food. None of these things are actually hurting you, but they all feel uncomfortable, don’t they? Next, think of a nice tight hug, snuggly blanket, pretty colors in the sunset, or pleasing music. These things are not physically necessary, but they feel good, don’t they? They are providing sensory input that your body craves. Not only do we need a balanced diet of food, but we all require a sensory diet as well. For most people, daily living will provide this balance for us, but many children need some extra input or avoidance. Identifying what your child seems to be avoiding or craving can help you make simple changes that make the day more peaceful. 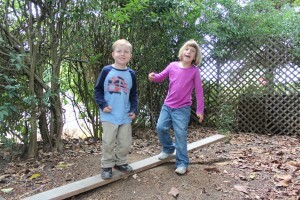 The child who is is constantly balancing on top of a pile of pillows to sit on the couch may benefit from a balance beam in their garage where they can challenge themselves. Someone who gets cranky from shopping may be visually avoidant – the bright colors, signs, and lights in stores can be overwhelming. This person may benefit from a minimally decorated bedroom and more organized environment. A child who bounces everywhere may be craving the high impact of coming down, and might enjoy a weighted blanket, heavy work (see below), and some bouncing on a trampoline. A child who talks loudly and is constantly crashing block towers or listening to the TV too loud, if a hearing issue has been ruled out, may crave increased sound. This can be provided through headphones, which won’t disturb other members of the family. When you have a child with special needs, you become accustomed to not expecting anything to follow any pre-set timeline. When typically-developing children are born later in the family, there is much less worry if a child is behind their peers by a little bit in some area, and less pridefullness if they are ahead. Teachers seem to appreciate my understanding that all children progress at a different rate, and if it’s within the range of ‘normal’ it’s 100% okay and no cause for concern. Avoiding embarrassment if your child is behind can help you to meet him where he’s at so that he is getting the help he needs. Likewise, avoiding feeling like you’re the best parent ever if your child is ahead of their peers will make you much more enjoyable to be around. 5. Knowing what developmental milestones your baby is working on helps you bond with them. I joke that I run a developmental assessment on my baby every week. But. It’s not really a joke. Once a week, or at least a few times a month I do look at a developmental milestone chart and see what he’s mastering, and what’s likely to come next. 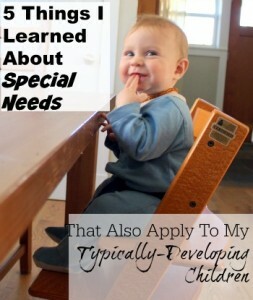 Not only does this provide reassurance that everything is going to plan (I won’t lie, I love the special needs stuff, but it is a lot more work and harder than raising a child that is developing typically), but it also gives lots of ideas for play activities that he absolutely loves. When we understand milestones, we see activities for what they are – he is naturally practicing an activity that he will use his whole life. It’s not a discipline issue, or something that needs to be changed, it’s just what he’s doing this week or month. Giving him opportunities to play and use his new skills is enjoyable for the whole family. For example, right now my 10-month-old just learned to put things in containers and take them back out. This has been really helpful (ahem) as he adds household objects that we need to our box that’s destined to go to the thrift store for donation. Or for all the Jenga blocks that are in every snow boot. Or for the blocks that are thrown in the dishwasher, kitchen towel drawer, or pull-out freezer. Rather than wondering why he is doing this, I understand that he just learned this skill, and he’s practicing it. To play we have an empty cashew container from Costco, and we place blocks in and out. It’s great fun, he LOVES it. Milestone charts aren’t just to make sure your baby is developing typically, and allow you to seek early intervention if he’s not, but they also provide a great heads up for what’s coming next, and lots of opportunities to play and bond with your baby. My 6-year old can make hamburgers on the grill, take out the trash without being asked, use a pocket knife (though he lacks the maturity to remember not to bring it to school, so I have it for the school year), and use money to purchase something at the toy store. He absolutely dresses himself, and knows what is appropriate to wear for school, church, and play. He’s responsible for keeping track of his mittens and homework folder. When you have a child who has special needs, you think about self care in a whole new way. When my children are developmentally able, I am more willing than many families that only have typically developing children to take the time to teach regular daily living activities, and put up with the messes involved while they learn to complete them. If a child is showing frustration from something that is developmentally appropriate, like putting on their own shoes, my experience with special needs makes me more likely to still require that they do it themselves rather than do it for them. When you are raising a child that has special needs, struggle isn’t something that is feared as much, and this bleeds into every aspect of life for all family members. Cara I concur with everything younlist here, and as both and a teacher in inclusive settings, I know that typically developing children “profit” from the care taken to create sensory friendly clsssrooms that are supposedly for the special needs students. As you said, more and more children have sensory issues, the numbers are like 1 in 6, so parenting and teaching can be much simpler when adults understand that behavior is communication, and our children, special needs or typically developing, are showing us what they need. Thanks for sharing this!